Fuel cell technology is a highly dynamic, constantly evolving field. It’s an area that attracts passionate supporters, from engineers who work with the technology, to evangelists who tout its environmental attributes, to end-users who benefit from it every day. As the technology is maturing, market adoption has increased drastically over the last decade. However, there is still work to be done. The key element in continuing to move fuel cell technology toward wide-scale adoption is focused cost reduction. And the good news is, technical advances are allowing this to happen more quickly than people had thought. It is accelerating at an exponential rate. To give you insight into how Ballard’s technology leadership is contributing to the global shift to zero-emission, we’d like to share a recent conversation we had with our Vice President of Technology and Product Development, Dr. Kevin Colbow. Kevin joined Ballard in 1994 and his areas of responsibilities have included research and development, product development, technology portfolio management and product management. Can you tell us a bit about your background? How did you get into the fuel cell space? I grew up in Vancouver and did all my formal education in the Lower Mainland. My father was a Physics professor at Simon Fraser University, so I actually did my undergrad degree in Physics there. I then went on to do my Masters at the University of British Columbia, which was focused on lithium ion rechargeable batteries and electrochemistry. After completing my PhD, I left the lower mainland to do my post-doctoral assignment in Germany. I was there for three years, but knew that I would return to Vancouver one day. Once I returned, I started to look for employment in the technology sector, and came across Ballard Power Systems. This was in 1994 and it was a small startup technology company that was founded on an idea that just might change the world. 23 years later, I’m still with the company! I’ve always been very interested in technology, and I really liked the idea of electrochemistry, batteries, electric vehicles, mobility - all these sorts of things that were really only visions at that time. I also knew I wanted to do something very applied, as opposed to staying in the academic world. I felt I wanted to try and make a more tangible contribution to society. How has Ballard evolved in the 23 years you’ve been here? When I joined, there were approximately 75 employees gathered in a small commercial space located in a suburb of Vancouver. Ballard had recently gone public, and was singularly technology-focused. Teams were working on a variety of applications - some early buses and stationary power. Customers were located in North America and parts of Western Europe. Over the years, we’ve evolved from being exclusively tech-focused to market-focused, and now customer-focused. A significant indicator of Ballard’s evolution is the sheer size of the company - we now have over 600 employees. Another thing I would point to is Ballard’s global footprint, with locations and markets all over the world. In the early days, the Ballard brand was certainly an interesting name. Now we are THE global brand for PEM fuel cell technology. I want to emphasize, one thing that hasn’t changed is the vision and desire of the employees to change the world. Power to Change the World® is something that’s underpinned our culture from the early days and still remains at the core of what we do. 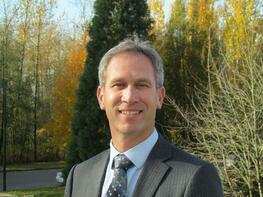 Ballard is providing fuel cell technology solutions services to leaders in the motive industry. What feedback have you received from these customers on why they chose Ballard? Over the years, we’ve worked with a number of auto companies. Currently the major program that we’re working on is with the VW Group, specifically Audi. We’re now completing the fourth year of a six-year program. There have certainly been lots of opportunities to talk to our customers and get feedback on how we are doing, and to find out why they chose to work with us. We have a team of fuel cell engineers that have a long history of experience across the value chain, from the electrochemistry catalysis right up to integrating and building the full systems. 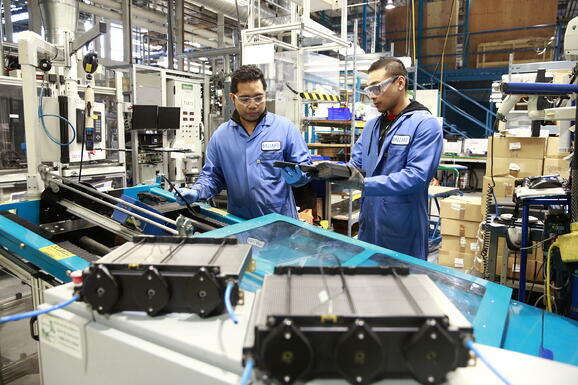 Technicians at Ballard’s fuel cell stack production facilities in Burnaby, Canada. At Ballard, we have 211 engineers, scientists and technologists, including 30 with PhDs and 48 with Masters degrees. Not many fuel cell companies have that kind of breadth of experience and knowledge. With over 2000 patents and patent applications, as well as internal knowhow and trade secrets, we can quickly provide our customers with confidence that they are working with the right people. We also bring novel technology pieces and information to the forefront and are able to apply them to the applications our customers are looking for. Here at Ballard’s headquarters in Burnaby, British Columbia, there are a couple of manufacturing and testing facilities. The centerpiece is a large space where we have over 60 fuel cell-specific test stations. These allow us to quickly test design and prototype small scale manufacturing equipment, which helps us stay at the forefront of development. Again, this gives our customers confidence that we can deliver reliably and with high quality. From a technical perspective, what are the major product challenges that Ballard is focused on solving in the next three-to-five years? Before I look to the next three-to-five years, I’d like to look at the last 10 years. During that time, there have been two main technical challenges for fuel cells. The first is driving down fuel cell manufacturing costs. The second is increasing fuel cell durability and lifetime. As I think ahead, these challenges will remain the same. There has been significant progress in the last 10 years, and there will be more progress over the next three-to-five years. But if you look at the marketplace, cost targets to meet real commercial markets are expected to continue to drop, while customer expectations for product lifetime continue to increase. The product is certainly maturing. It’s also important to speak to the product’s total cost of ownership over the long term. During the last 10 years, we’ve been focused on reducing the capital cost. Going one step further, you have to think about hydrogen fueling costs, maintenance intervals and other operating costs. As we look forward to the next three to five years, that total cost equation, the total operating cost is critical in continuing to drive down costs. There’s debate in the industry on the right plate material for PEM fuel cells – metal vs. graphite. What’s Ballard’s perspective? How do we help customers determine the best choice for their product? It really is product dependent - and depends on both technical and strategic factors. Given we’ve worked in these areas for many years, and have worked with tier one automotive manufacturers, we have a long history of looking at these problems from many perspectives. Really what we do is take customers through that knowledge, pointing them to both the technical and strategic elements of their decision. On the technical side, we have to think about things like corrosion, durability, freeze start, heat rejection, power density, and weight. On the strategic side, we look at costs in the near term, costs in the longer term, recyclability, supply chain for some of the raw materials involved, and other elements of the competitive landscape. What we really do is take customers through a structured decision matrix methodology to help them make the choice. In terms of Ballard’s perspective, we’ve done a lot of work in both areas - with bipolar graphite plates and metal. Historically, the mechanical strength of metal, as compared to graphite, has enabled higher power density in the bipolar plates. 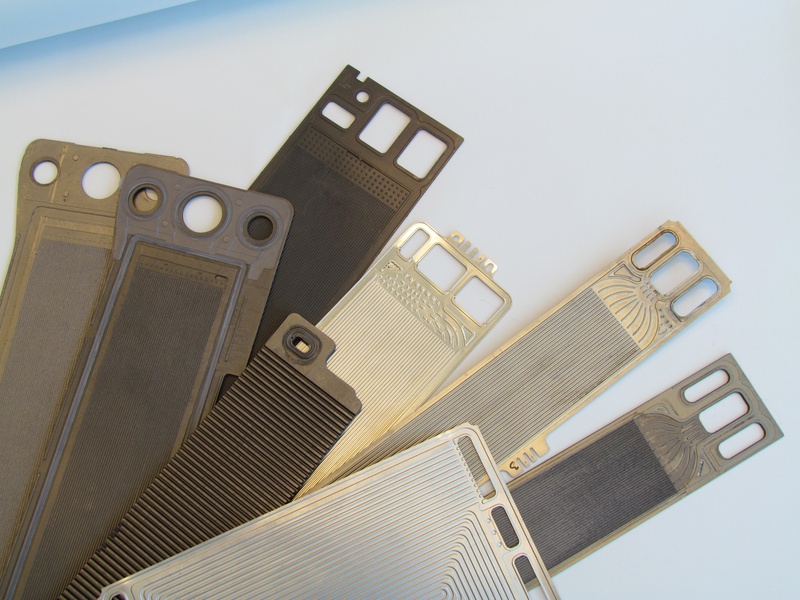 A selection of metal and graphite bipolar plates for PEM fuel cells. But part of the trade off is the corrosion challenges with metal in a liquid fuel cell environment. It can be costly if you have to apply protective coatings to the metal plates. Today the gap between metal plates and graphitic plates in terms of power density is closing, and we will continue to monitor this and have the capability to work with both. Today, Ballard’s products include graphite. There’s a drive to find alternatives to precious metal catalysts. How is the Nisshinbo/Ballard collaboration advancing this next step for PEM fuel cells? This question is very related to the cost reduction theme that we spoke about already. When I first started back in 1994, a typical platinum loading in a demonstration fuel cell ranged from eight-to-ten milligrams per centimeter squared (mg/cm2) of platinum, which is a lot. To give you an idea of how things have evolved in our products and with the industry standard, that number is now somewhere around 0.4 - 0.5 mg/cm2. That’s a factor of almost 20X in terms of improvement. The Nisshinbo-Ballard collaboration is really the next generation beyond platinum catalysts. Our collaboration, which dates back to 2013, has been focused on non-precious metal-based catalysts, called NPMC’s, which have no platinum in them. We are basically trying to take the platinum content from 0.5 mg/cm2, ideally down to zero. This is attainable, and we are working through various scenarios to achieve this goal. 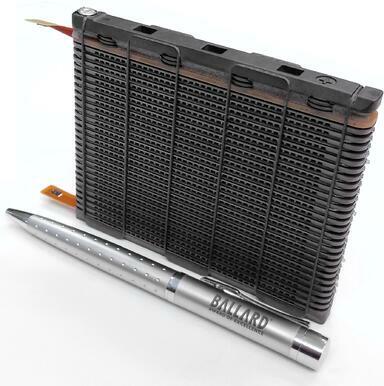 Ballard FCgen®-1040 prototype fuel cell stack, with Non Precious Metal Catalyst (NPMC). This, of course, will have a tremendous impact on driving down costs - in this scenario, you could reduce the platinum content by more than 80%. When you think about today’s levels, platinum makes up about 10-15% of the costs of the fuel cells. So this opportunity will make some real advancements. Just in September of 2017, we announced that we are introducing this non-precious metal catalyst into a lightweight application, our FCgen®-1040 micro fuel cell stack. The announcement made a real impact, and the market response certainly exceeded our expectations. It underpinned the importance of work in this area, and the promise that it potentially can hold. While this micro fuel cell stack is lightweight in terms of application and has relatively short durability requirements, the next steps will be to evaluate the readiness of this new NPMC approach for new applications, like material handling. So the work continues. Ballard’s team of experienced engineers, our intellectual property, and our state-of-the-art facilities have driven us to the forefront of fuel cell technology leadership. We are committed to implementing technology advancements that reduce fuel cell costs, and increase durability and lifetime. To achieve this, we rely on our depth of experience to explore and implement technical innovations in PEM fuel cells. Key considerations include continuing to refine metal and graphite bipolar plates, as well as working to reduce platinum content in the fuel cell stack. As always, our vision, Power to Change the World®, is the driving force behind everything we do. We remain committed to it, as we all work together to bring zero-emission mobility to markets around the world. Learn what technical and strategic attributes manufacturers must take into account when assessing a technology for mass production.